The Cougar Revenger S Gaming Mouse offers a premium design in black with an illuminated logo and scroll wheel as well as an impressive degree of adjustability. This mouse utilises the sought after PMW3360 sensor from Pixart along with the exceptionally durable and reliable micro switches from Omron, capable of withstanding up to 50 million clicks. No matter the resolution of the FPS-, MMORPG-, MOBA- or RTS, the Cougar Revenger S is always ready with the exact DPI required. 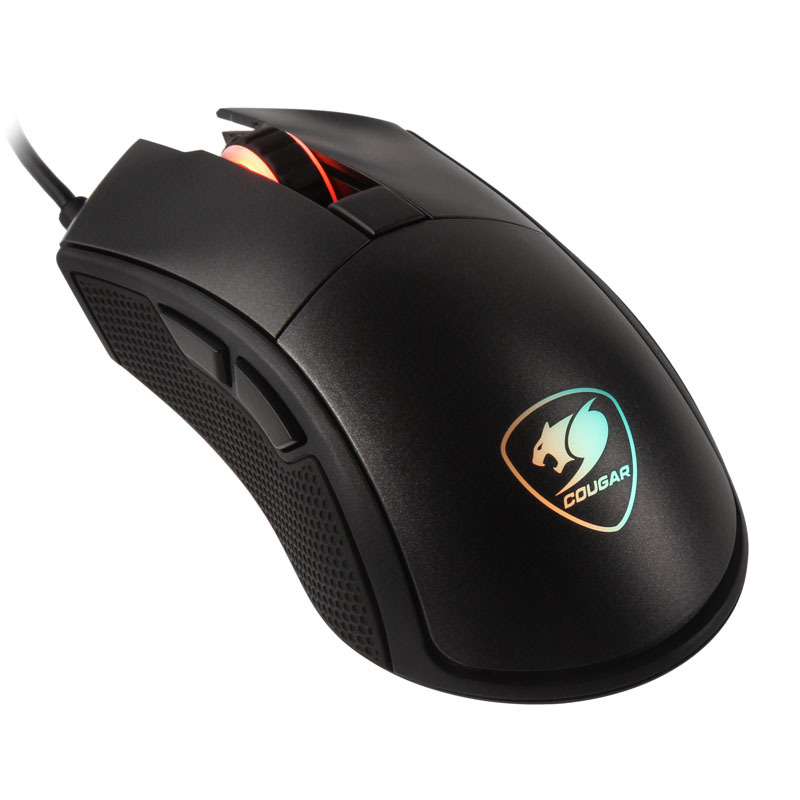 The DPI itself can be adjusted between 100 and 12000 using buttons on the mouse itself. When it comes to the number of keys, Cougar focuses on the essentials: In addition to the usual main keys, there are two other buttons situated on the side. The scroll wheel can also be used as a button. Directly in front of this is the button for adjusting the DPI. All six buttons are programmable. While the 512k onboard memory allows a total of three profiles to be stored, these profiles are setup in Cougar's extensive software suite. in the extensive software. This sleek and slim mouse has also been developed especially for right-handed users and comes with a rubberised inlay to offer the optimum grip, regardless of how hectic things get in the heat of battle. Furthermore the mouse comes with premium RGB lighting that not only illuminates the logo, but also the scroll wheel in a whole range of different colours. Large mouse glides ensure that the mouse glides across all surfaces with ease. 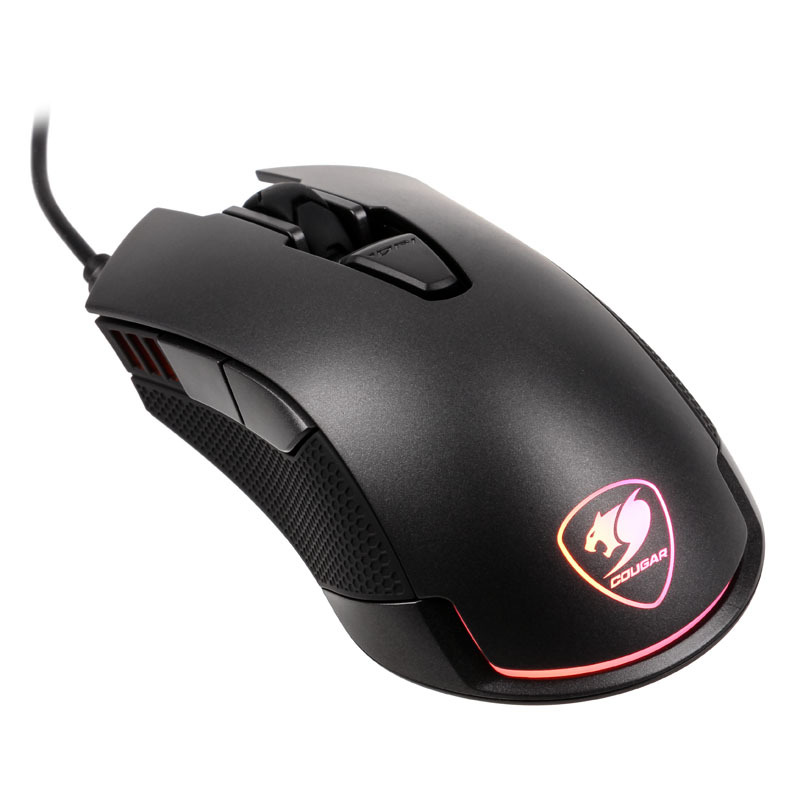 The Cougar Revenger Gaming Mouse is distinguished not only by its stylish black design, but also by its particularly striking blend of LED lighting across two zones - in addition to Cougar's choice of technology. This mouse is equipped with an extremely precise optical PMW 3360 sensor from PixArt, a sensor that enables settings ranging from 100 - 12.000 DPI and is convenient and effective across all surfaces. Reliable and durable micro switches from Omron, in conjunction with the premium case and the textured sides elevate this mouse into the tool of choice for online competitors everywhere. The Revenger possesses two main buttons along with two thumb buttons, as well as a mouse wheel and a further button behind the mouse to make a total of six programmable buttons. Cougar's UIX software as well as 525 KB of onboard memory (3 profiles) enable extensive customisation to meet your preferences when it comes to layout and lighting. In addition to the DPI-/profile indicator, the Revenger also comes with lighting towards the rear of the mouse - lighting which can be adjusted in colour using the UIX software independently of the indicator - the mouse has RGB-LEDs in both places. The durable Omron switches allow for at least 5 million clicks and - speaking of durability - the mouse is connected to the PC with the help of a well-constructed 1,8 metre long cable. 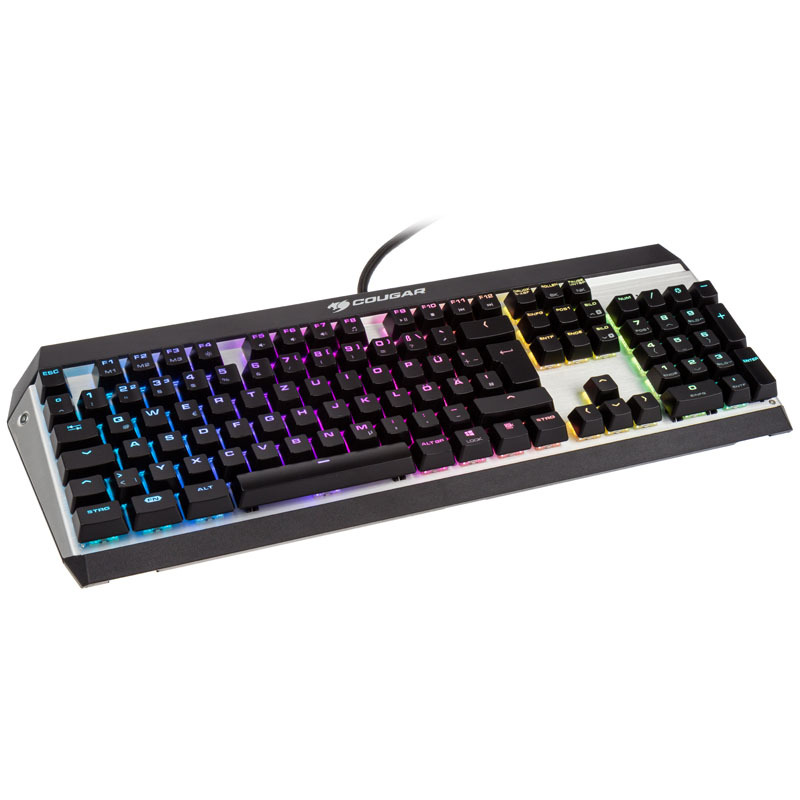 The Attack X3 RGB Speedy from Cougar offers the essential features of a professional gaming keyboard without losing sight of the importance of aesthetics, and for that reason Cougar has provided an pleasingly high-end case for the keyboard. The extensive features on offer here include a configurable USB polling rate, 1ms response time, multimedia buttons as well as programmable keys. This version of the Attack X3 RGB Speedy comes with Cherry MX Silver switches. Keyboards with Cherry MX Silver switches represent a balance between being designed purely for gaming and being ideal for typing. The included UIX software rounds out the feature set of the keyboard with the ability to quickly and intuitively adjust the response time, macros and profiles - such customisability has never been easier thanks to Cougar's design. Another highlight of the Attack X3 RGB Speedy is the individually customisable RGB-LED backlighting. This lighting is not only available in numerous colours, but also in a whole range of patterns and effects. 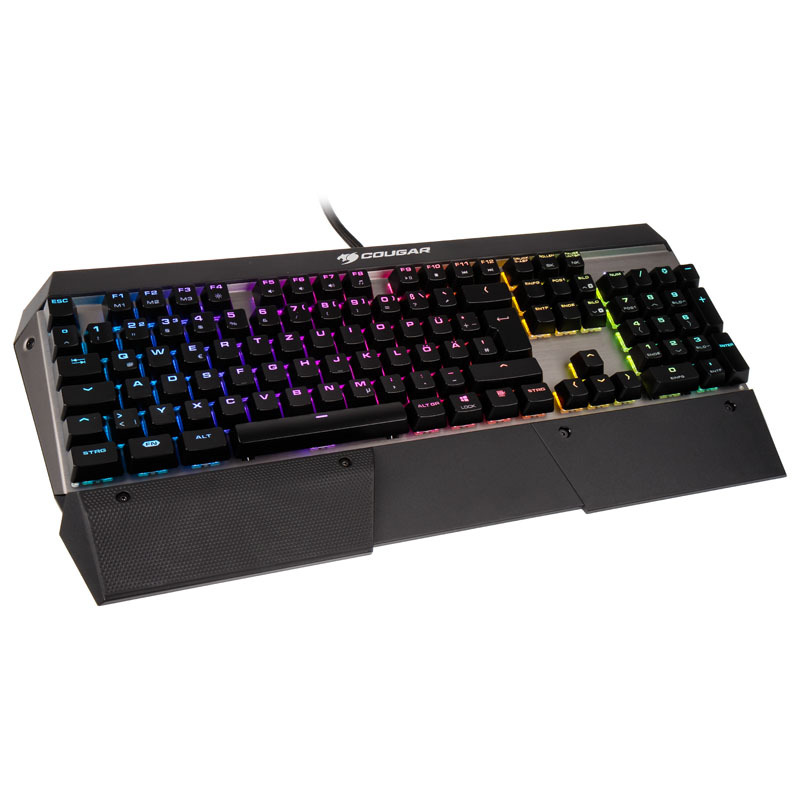 The features of the Cougar Attack X3 RGB gaming keyboard include, among others, a configurable USB polling rate, 1ms response time as well as multimedia buttons, programmable keys and Cherry MX switches. Another highlight of the Attack X3 RGB is the customisable LED backlighting as it allows five different brightness levels and 16,8 million colours. Nine stylish effects are also available to ensure that the keyboard truly looks unique. The UIX software included by Cougar offers extensive customisation, allowing users to adjust everything to meet their personal requirements down to the smallest detail. This intuitive software makes the process as straightforward and user friendly as can be, meaning that not only can you get back to your game more quickly, it does it in style to boot. Features include fast response time adjustment, macros, as well as profiles - and it's never been easier.